There is no doubt that food fibre consumption brings many benefits. However when it comes to fibre and diabetes, there are some very important benefits brought about by fibre. You can include food with good fibre content in your daily meals. It is necessary to know that only plant related food items can contain fibre. For example, fish, eggs, meat and even milk do not contain fibre. 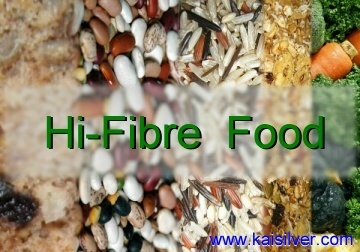 One benefit of fibre that many people are aware of is that, it helps digestion and keeps away constipation. While this is indeed tru, there are many more benefits that come with the intake of fibre. It is therefore important that you read the details on this page and understand it's contents. A look at the above image will give you a quick look at the foods that are good in fibre content. We will discuss these foods in more detail so do keep reading this very interesting health article. We will first of all give the technical explanation of fibre, which is basically a type of carbohydrate - scientists refer to fibre as a complex carbodydrate. As for nutritiional value fibre does not have much to boast about, but the other functions that it plays are extremely useful and essential to the human body. We just talked about how eating fibre containing foods help to keep away constipation. Let us now talk about other benefits that fibre brings, especially in the context of diabetes patients. At the same time we would like to say that, you need not be a diabetic to experience the health benefits brought about by fibre. One common problem faced by many patients suffering from diabetes is related to the sudden and aprupt, increase in blood sugar levels. This poses problems for the patient and brings challenges to doctors. Fibre containing foods have a low glycemic index, this is a technical term so let us put it in simple words. Such foods are able to manage a controlled release of sugar into the blood. The insulin in the body is then allowed to perform it's function more effeciently. Talking about insulin and diabetes you could be aware that, some diabetes patients need to be admistered insulin externally. This is normally done by the intake of supervises doses of insulin - this could insulin in the form of an injection or as tablets. Fibre is able to control the release of sugar into the blood, improved insulin usage could prompt a medical advisor to reduce the size or frequency of the insulin dose admistered externally. This brings relief to the patient and reduces the challenges faced by the doctor. One other complication developed by people who have had diabetes over a period of time relates to heart related ailments. Heart problems could come up in anybody and not only in diabetics but, it causes more complications when coupled with diabetes. Including fibre containing food in your daily diet helps to reduce cholestrol in the blood. The accumulation of cholestrol is one of the main causes of heart disease. So one of the benefits of fibre is surely it's ability to reduce cholestrol. And remember doing it the natural way is better then leaning on medication. So what are the foods that are rich in fibre. All vegetables and fruits are good for fibre content, ofcourse diabetics should avoid high sugar fruits like banana, mango, jackfruit etc. The way to derive maximum fibre benefit from fruits and vegetables is to eat them raw, probably in the form of salad or mixed with yogurts. Apples, cucumber and even carats are rich in fibre. When you talk about eating fruits and vegetables raw, it is good to thorougly wash them in clean water before skinning or cutting them. Infact leaving the skins of apples, carrots etc is better for your health. If you prefer to take off the skin from these, just make sure that you take off as thin a layer as possible. Another food source of fibre are cereals, oats and even bean seeds in various sizes, shapes and colors. When eating bread, choose whole wheat break rather than the white bread. If you are a rice eater, get used to eating unpolished rice, the bran that clings to the skin of the rice seed (before being polished). We will talk about bran in the next paragraph. You can get packets of bran in big supermarkets or health stores. This is the outer skin of rice seeds or even oats and cereals. Include bran as an ingredient in your cooking recipes. For example if you make bread or make rotis (Asian) or pitas, add a portion of bran powder to the wheat flower. Bran can also be used as a thickening agent in soups and curries. We do hope that you have enjoyed reading this health article on diabetics and fibre in food. Please remember that this information is not to meant to substitute any professional advice or treatment that you are currently undergoing. You should discuss any change in your eating or excercise patterns with your doctor BEFORE implementing those changes. If you have any comments or suggestions related to this article or anything on this website, please email our team at easyrambler@rocketmail.com We always welcome your views and comments.